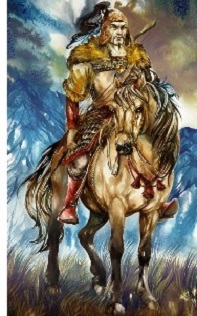 Attila the Hun (?-453) - The Genghis Khan before Genghis Khan, Attila was one of Rome's most feared enemies of the 5th century. He was born to a nomadic tribe known as the Huns. Without any concrete evidence, it is believed that the Huns were descendants of the Xiongnu which equally terrorized China for centuries in the East. The construction of the Great Wall (see Great Wall) as well as a powerful Han Dynasty made China a tough target, causing (most likely) the Xiongnu to migrate west. The vast steppes of Central Asia and Eastern Europe took years, even decades to cross, and along the way, they probably intermingled with other nomadic groups, like the Scythians (see Scythians). When they arrived in Europe, they found a weakened Roman Empire ripe for invasion. Initially, they displaced the indigenous Goths of Northern Europe (see Battle of Adrianople) in the late 4th century. But in about 434, a new leader arose who was not satisfied with simply occupying Northern Europe. His name was Attila, and he was a fearsome warrior. As his people were barbarians, our knowledge of him comes strictly from Latin and Greek sources, and nothing of his early years is known. Obviously as adversaries, his chroniclers probably portrayed him in unfavorable terms. He was known as the "Scourge of God" (sounds pretty unfavorable to me), and he created plenty of trouble for both the Eastern and Western Empires. The primary source for his life comes from Priscus, who was a Roman diplomat to the Eastern Empire at the time of Attila. He wrote an eight volume history in Greek of the exact period in which the Hun lived. Unfortunately, his work is mostly lost. However, it has been referenced extensively by later writers, so we do have much of it from other sources. In addition, Attila was so famous that he appears as a character in the German saga, Nibelungenlied, as well as the Viking Eddas. He rose to power, along with his brother Bleda, around 433 or 434 on the death of their uncle, Rugila. The first known contact between the Romans and Attila (and Bleda) was peaceful. The two Huns met with Eastern Roman officials in 435 and negotiated a treaty. However, even then, the agreement was based on underlying tension between the kingdoms. The Eastern Empire agreed to pay the Huns an annual tribute of gold in exchange for being left alone. It's not that they couldn't have repelled a Hun invasion, but for a nation as wealthy as theirs, it was simply less costly to pay them off instead of fight them. And so for about the next five years, the Romans had almost no contact with Attila. The Hunnic Empire was vast enough that it stretched east and bordered along the Sāssānid Empire as well. Since it had a treaty with the Romans, it spent that time invading Sāssānid territory. In 440, though, the Sāssānids drove the Huns out and Attila turned his attention back west. That same year, Attila and Bleda violated their treaty with the Romans, crossed the Danube and invaded Illyricum. At the time, the Western Empire had been involved in a conflict with the Vandals, led by Geiseric, in Roman North Africa. Emperor Theodosius II of the Eastern Empire, lent troops to the Western Emperor Valentinian III to help defeat the Vandals. But with the invasion of the Huns, Theodosius had to recall his troops, leaving the Western Empire to fend for itself (the result was a Vandal victory and the loss of North Africa by Western Rome). While the Eastern Roman troops were mobilizing, the Huns turned east in 441 and invaded the Balkans. When Attila learned that a Roman army was approaching, he offered to withdraw in exchange for a new treaty. Theodosius declined believing he could defeat the Huns. He was wrong. The Huns beat the Romans at Callipolis and approached the city of Constantinople itself. Only its massive walls stopped them. Now Theodosius admitted defeat and negotiated a new treaty with Attila. It was rather harsh, requiring an immediate payment of gold and tripling the annual tribute. The Huns withdrew, and shortly after, Bleda died (in 445), leaving Attila as sole ruler. His cause of death is not known for sure, however, later Medieval accounts (which do not document their sources) state that Atilla killed Bleda in an internal struggle for power. Some say that Bleda tried to kill Attila first, but failed. Attila was content to remain in his land for a few years, but by 447, he grew restless and again invaded Roman territory. Theodosius sent an army under the command of Arnegisclus to meet the Huns at the Battle of Utus, again in the Balkans. Again, Attila defeated the Romans, but his own losses were heavy. He briefly advanced, but the depletion of his forces made an attempt on Constantinople impossible. Theodosius worked out yet another treaty with Attila, upping the tribute yet again. In addition, the treaty stipulated the conversion of a large swath of Roman territory south of the Danube to serve as a "no man's land" between the two kingdoms (perhaps history's first neutral zone). Now that a new peace was established with the Eastern Empire (and perhaps realizing he was probably never going to capture Constantinople), Attila turned his attention west. Though the Western Roman Empire was not his target; he had forged a tentative alliance with Emperor Valentinian. His plans were to invade the Visigothic Kingdom in 450. However, an event along the way changed everything. Valentinian's sister, Honoria, had been promised to a Roman senator in marriage whom she did not like. So she dispatched a message to Attila requesting that he come rescue her, and included her engagement ring with the letter. Attila interpreted this as a proposal to him. He accepted the offer and demanded half the Western Empire as a dowry. When Valentinian learned of this, he obviously rejected this idea. This created a shift in power. While Attila was marching westward conquering territory, Valentinian forged a new alliance with Theodoric I of the Visigoths. 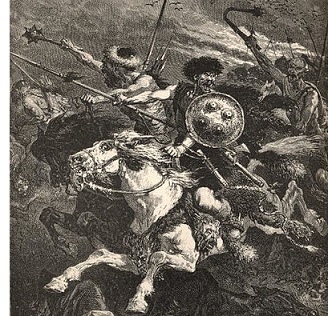 Their combined forces intended to stop Attila's advance in 451 at a place called Catalaunian Plains in northern Gaul. The Roman army was under the command of general Flavius Aëtius and Theodoric led the Visigoth army himself. The total size of the two opposing armies was thought to be roughly the same. In a hard fought battle, both sides suffering heavy losses, it was the Roman-Gothic alliance which prevailed. However, Theodoric was killed and Attila survived. He had not given up on his plan to marry Honoria, so he re-gathered his forces and invaded Italy in 452. An interesting event which occurred as a result of this invasion was the founding of the city of Venice. As refugees fled Attila's advance, they sought safety on the islands formed by the Venetian Lagoon. Attila never made it to the interior of Italy. Disease is thought to have broken out and ravaged his army was he was still in the north. He withdrew and returned to his own land. For all the fear he struck in the hearts of his enemies, Attila died a rather inglorious death. In 453, he married a young woman named Ildiko. The exact cause is not certain, but the most common account is that on the night of his wedding, he celebrated with a bout of heavy drinking, and at some point, suffered a nose bleed (perhaps he fell an injured himself). He lied down on his bed and passed out on his back, resulting in his death by drowning in his own blood. The Hunnic Empire did not survive long after his death either. It was defeated the following year by a Germanic army at the Battle of Nedao, and limped along for another 15 years before breaking up under the weight of poor leadership.